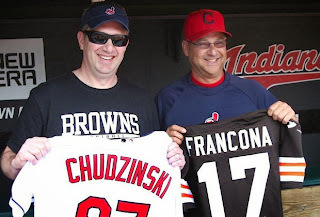 Oh, how happy, you have made me..
How many days like this has there been in all of our years of Cleveland fandom? Four hours of an otherwise ordinary late-September Sunday were a happy confluence of events where everything came together for us like a once-a-century alignment of the planets. The Browns, so bedraggled and dysfunctional after two depressing losses and the ice-water-to-the-face trade of last year's No. 1 pick, suddenly seem like the toast of the AFC North. Just about 30 minutes after the Browns' exhilarating win over a division rival (and just writing "Browns" and "exhilarating" in the same sentence is a pleasant change from the norm), Jason Kipnis was snagging a seeing-eye ground ball to send the Indians into whatever farkakta Wild Card playoff system MLB has set up. Today just felt good, and perhaps all the sweeter for its infrequency. Fanbases supporting historically winning franchises simply cannot understand what days like this mean to Cleveland die-hards. A football team scratching it's way to .500 and a baseball team having to win a one-game playoff just to make it into the division series would likely be humdrum for fans in New York, Los Angeles or Boston. In Cleveland, where the post-LeBron era has produced a total of zero playoff appearances from all three major franchises - well, it's like a dying man getting that first sip of water after years baking under a merciless desert sun. It's a beautiful thing, really, and all the more lovely for the way it's connected the city to something good and positive. We're so used to negatives piling on top of negatives, and abysmally tired of defending ourselves from tousle-haired Douche Baggins' types who work for cologne-scented men's magazines and write lazy, cheap hit pieces about the sorry state of Cleveland sports. The sun shined down on our city today, Cleveland fans, and there's nothing wrong with lifting our faces to bask in those warming rays. It's something we could get used to.